Fortiche | One quality, the finest. 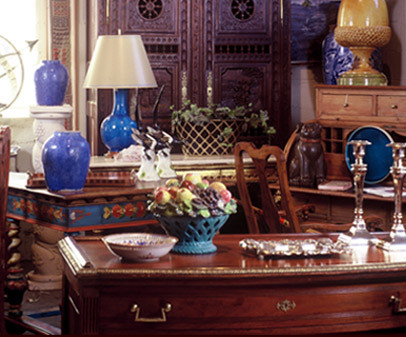 The Barn at 17 has one of the best selections of antique furniture and accessories that we have found in the Boston area. The building looks a little decrepit on the exterior, but inside it’s Ali Baba’s cave, chock full of heirloom-quality treasures. They are affiliated with a restoration business on the property, so any pieces for sale are in pristine condition. After touring the huge warehouse, I asked my husband what he would load in the car if money were no object. He was sincerely stumped – there was so much wonderful merchandise on offer. We decided that our hypothetical purchase would be a carved china cabinet from a Boston cabinet maker. If you’re not in the Boston area, they also sell on One King’s Lane; just type their name in the search box. Fortiche (for-teesh) is a slang term that means that something is really terrific. The Barn at 17 is fortiche from the smallest objet d’art to the largest dining room suite. This entry was posted in Décor, French Vocabulary and tagged antiues, Boston, Fortiche, One King's Lane, The Barn at 17. Bookmark the permalink.